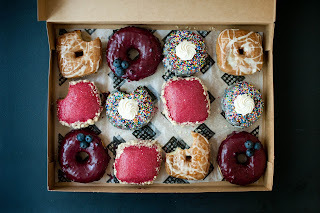 A week ago Edible Skinny was lucky enough to check out Astro Doughnuts and Fried Chicken while in hubbub of DTLA and they are Super (with a capital letter S) Fab (with a capital letter F)! Now Stop! 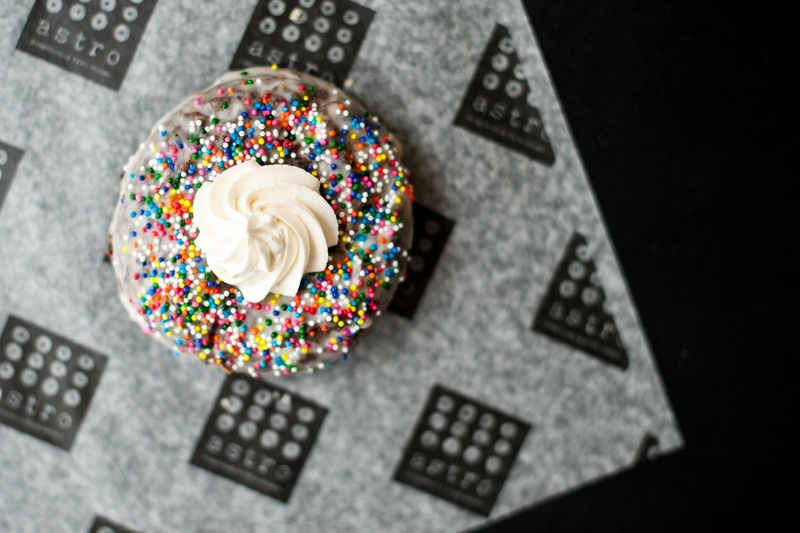 I know that every Angeleno rolls their eyes at the idea of another sweet shop in LA; I mean, once Sprinkles premiered its Cupcake ATM we thought everything had been done… But Astro does some Darn Fine missing hole sweetmeats! 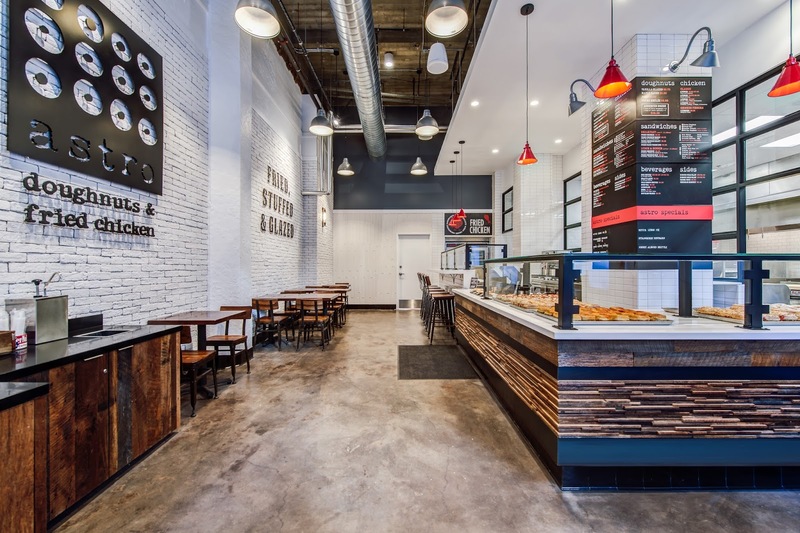 And the originally from DC Astro, which opened its LA outpost in April of this year, has the confectionary street credit to back it out. The shop was called by TimeOut an “exemplary fryery” and one of the top-21 best fried chicken restaurants in America. Thrillist named Astro among the “21 best donut shops in America,” and the Washington Post crowned the Crème Brûlée doughnut “the city’s best.” Let’s drop the mic for some sucré accolades! Astro Doughnuts and Fried Chicken offers a combination of four classic daily doughnut flavors (Vanilla Glazed, Maple Bacon, PB&J, and Crème Brûlée) along with a rotating selection of specials. When Edible Skinny was there choices included: Birthday Cake, Cherry Pie, Blueberry Lemon Thyme and Root Beer Float made with Boylan Root Beer. The newest class of doughnuts are available for a few weeks before they disappear like the cast of Brigadoon after their contracts haven’t been renewed. My absolute favorite of this group was the Birthday Cake, moist chocolate cake topped with a sweet (but not too sweet) white cream and sprinkles! 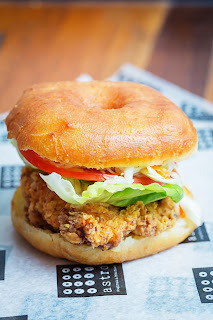 For the Carnivores (read not me) Astro offers fried chicken with all the classic fixins’; if your idea of classic fixins’ include Buns such as doughnuts or their cheddar biscuit (BTW: one of the best biscuits of my life, and I absolutely scrutinize biscuits! ), Sauces such as Sriracha Buffalo and Blue Cheese, and Add-Ons such as Kimchi Cole Slaw and Pickled Jalapenos. I decided to rock all these options with an egg sandwich and it was simply Fab Fab (a big shout out to D. Lo and Marta for the suggestions!). The whole dining experience has a fast paced Chose Your Own Adventure feel to it, as if the energy of hip hop came in doughnut form. This was finished by some of absolutely best tater-tots in my life! They were a perfection of crispy outside igloo-ing the perfect amount of warm potato goodness housed within. I’m tell you head over and drop the $2.95 (less than a cup of coffee at Starbucks) to rock them with some Sriracha Buffalo! A bit of history, the first Astro Doughnuts opened in DC in 2013, when childhood friends Elliot Spaisman and Jeff Halpern, the first native Washingtonians to play for the Washington Capitals, bonded over a love of all things missing a hole. Halpern and Spaisman grew up playing the sport together in Montgomery County, MD, often meeting for a post-game doughnut off the ice. As adults, the two food lovers forged their childhood pastime into a local eatery offering lighthearted interpretations of two comfort food favorites: doughnuts and fried chicken. Leveraging Spaisman’s experience at Balducci’s (formerly Sutton Place Gourmet), the duo found ways to add a modern spin to classic recipes with inventive seasonal flavors, culturally relevant releases, and sandwiches combining both items for a new take on the traditional southern combo of waffles and fried chicken. Something to take note about the LA Astro Doughnuts, a lot of people work there… which means that they’re really busy… which means they’ve got a lot of customers… which means they’re making money. According to James Brice, member of the kitchen staff at the LA location, Astro is are already actively seeking to open a second location in the City of Angeles and acquire a food truck (because what would a doughnut shop be in LA without a food truck… LOST, that’s what!). 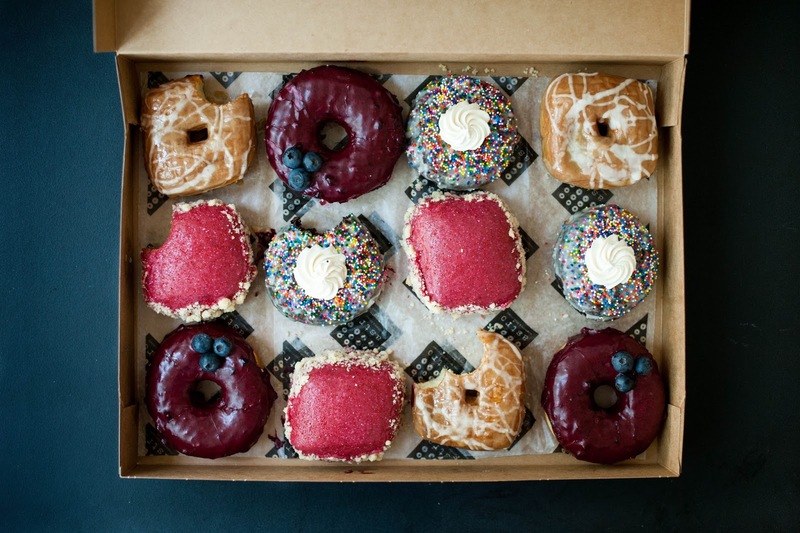 So if you’re looking for doughnuts, fried chicken, and the best tatter tots of your life head over to Astro Doughnuts! "I don't know how many Michelin stars are on stage, but it's a lot." A few weeks ago Edible Skinny was lucky enough to enjoy the foodie high life at the 11th Annual Vegas Uncork'd, a four day long food extravaganza held by Bon Appétit. Vegas Uncork'd is the premier culinary and wine event in Las Vegas, offering exclusive one-of-a-kind experiences with celebrity chefs. The weekend was quite the epicurean whirlwind full of high living hors d'oeuvres to champagne connoisseur-ing. Here's our recap of the indulgence of great wines, tasty morsels, and seeing all our favorite celebrity chefs IRL (aka In Real Life). Our first foray into this world of bites of bliss was Celebrate Spago, a 25th Anniversary Lunch with Wolfgang Puck at Forum Shops at Caesars Palace. The event, hosted by the darling Andrew Knowlton, the Deputy Editor of Bon Appétit, was a Candyland experience for the taste buds. It marked the 25th anniversary of Wolfgang Puck in Las Vegas, who unfortunately wasn't able to attend because of an emergency. Because I was a Veg many aspects of the original menu was redone for me, but the original four course menu included a simply fabulous Carrot dish! Topped with miso carrot puree that had been fermented for eight months and finished with a carrot infused oil the dish was divinity in vegetable form. Perfect for everyone from a high dining Bugs Bunny to a standard operating carnivore on Meatless Monday! It was paired perfectly with a Grgich-Hills Chardonnay from Napa Valley, a bottle, like many, distributed by wine sponsor Southern Glazer's Wine & Spirits of Nevada. The delectable dessert of this event was the White Chocolate Rhubarb with Citrus Cake and Fennel, a unique submission in a world saturated by. The sucré morsel was paired with the fantastic finishing wine of Alois Kracher Cuvée Beerenaslese from Burgenland, Austria (and to celebrate one of the most successful Austrian chefs in Vegas)! Immediately after our delights at Spago I swung over to Mandalay Bay's Libertine Social for their Fireside Chats to a meet, and greet, and eat with Chef Shawn McClain. Libertine Social is a next-generation gastropub with a variety of experiences ranging from an uber-social center bar to a more secluded classic cocktail room. With an "Arcade Bar" (which is their version of an alcoholic set of Russian nesting dolls with a bar within a bar) full of "libation and parlor tricks." I was in brown bar heaven (I'm a totally Bourbon girl!). This is a "'Bar' Bar" with drinks categorized into Daisies and Fixes, Cobblers and Cups, and Juleps and Smashes. In honor of the impending Kentucky Derby we imbibed Prescription Juleps composed of Piere Ferrand 1840 Cognac, Rittendhouse Rye Whiskey, Fresh Sprearmint, Demerara Syrup, and Appleton Jamaican Rum. This was paired expertly with the fantastic Caviar "Fried Egg" made with Kaluga Caviar (but not for the Veggie), Corn Pudding, and Brioche. The dish was created as an "approachable caviar dish," and I have to say that the presentation made this Veg question whether or not she might want to approach it! Another standout dish was the Roasted Cauliflower with Hazelnuts, Romesco, Dates and Toasted Breadcrumbs. Crafted by Chef Shawn himself behind the grill (who also has restaurants Five50 and Sage in Vegas) the dish was the perfect balance of vegetables to remind me of the glories of greens! But there was no rest for the foodie as the next day I headed over to Picnic in The Park, a delightful picnic at The Park, located between Monte Carlo and New York-New York featuring some of MGM Resorts' most notable chefs including including Alain Ducasse, Charlie Palmer, Michael Mina, Julian Serrano, Rick Moonen, Tom Colicchio, Shawn McClain, Roy Ellamar, Akira Back, and David Werly. It was an event that was so pretty, it should have its own Pinterest page! Picnic in The Park offered creative twists on classic picnic dishes, Edible Gardens and champagne provided by Veuve Clicquot. But I was in a city that never sleeps, especially for foodies, so I dashed over the next event Sweet Escape, which was an Evening of Buddy, Beignets, Bonbons & Booze at The Venetian. Hosted by TV personality Buddy "Cake Boss" Valastro this poolside reception was the ultimate decadent evening to surrender to the sweet side of life, featuring a number of world-renowned chefs of The Venetian and The Palazzo, each preparing a unique take on confectionaries such as beignets or bonbons. There were Oreo Beignets (from LaVo, and they were Auh-Mazing! ), Vanilla Vodka Cream Soda drinks, a 30 foot donut wall, and coffee drinks crafted with your favorite chef's profile in latté art! My final foray into this epicurean marathon meal at Rao's at Caesars Palace. A traditional Sunday Brunch to close out Vegas Uncork'd by Bon Appétit, the event featured the actual Rao's Family. Rao's partners Frank Pellegrino Jr. and Ron Straci hosted "Little Italy From City to Strip" which has been one of the festival's most beloved event for several years. The sold out brunch was not only a feast of Rao's time-honored dishes, but was also interactive, as guests were walked through how to make pan-seared steak and Zeppoles. First course, I partook in the Roasted Red Peppers with Tossed Golden Raisins and Pine Nuts. This was paired with a Rotari Talento Trento Brut Rose Trentino Alto Adige, Italy. The second course featured Lobster Oreganato of Lobster Grilled and Toasted with Oregano Bread Crumbs. Pan-Seared Steak with Sautéed Mushrooms and Onions. Sides included some simply fabulous Baked Beefsteak Tomatoes and Asparagus and Parmigiano Reggiano. This was paired with the delightful Luigi Righetti, Valpolicellla Classico Superiore Campolieti, Veneto Italy. And can I say Yumm (with 3 Ms!!!) Dessert consisted of fresh made Zeppoles, aka deep-fried dough balls for those who didn't grow up in the Italian populated New Jersey, with Blackberry Gelato. This was paired with Mezzacorona, Moscato, Vigneti Delle Dolomiti, Trentino Alto Adige, Italy. Boun Appetito!!! But all good eats must come to an end and so until next year the kitchen is closed on Vegas Uncork'd! Here's to life being delicious and every day being an epicurean whirlwind!